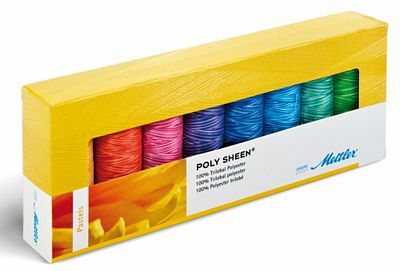 Contains 8 spools of Mettler Polysheen thread. 220 yards per spool. 8 220 yard spools. Colors- Violet Hues 9921, Lipstick Pinks 9923, Fiesta Orange 9924, Sunny Rays 9925, Nautical Blues 9929, Aqua Waters 9930, Minty Leaves 9931, Spring Grasses 9932.